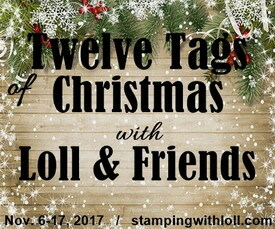 Below the photo of my tag I have listed the techniques and products that I've used. If you want more information, please email me using the email contact form in the sidebar. Marcia's tag information and how to's are listed on her blog (link provided). Click HERE to be redirected to Marcia's blog. There you will find out all the info on how she made this beautiful tag! Make sure to leave her some love. :) Thank you! 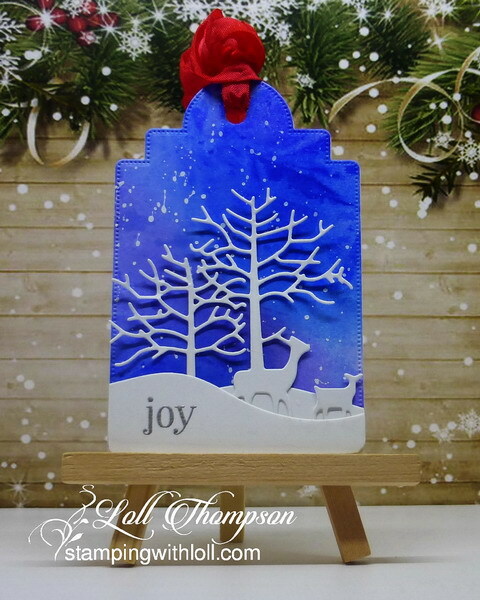 Gorgeous smooshed Brushos sky background Loll for your wonderful die cut Winter scene. Thank you again for gifting my the same die my friend. That is such a glorious blue sky, Loll, and those are some tiny die cuts. My favourite of your tags so far, Loll (bet you can guess why!). Gorgeous brusho sky and wonderful use of the deer / tree die. Love it paired with Marcia's tag that also uses a reindeer. I LOVE that sky! What a vibrant and beautiful color. Love the bit of texture in it representing clouds, as it should be. This is such a gorgeous scene, Loll! Another day of amazing creative tags Loll. Love the deep blue sky with the different shades and falling snowflakes. Fabulous die cutting. Love Marcia's card with the birch tree background. 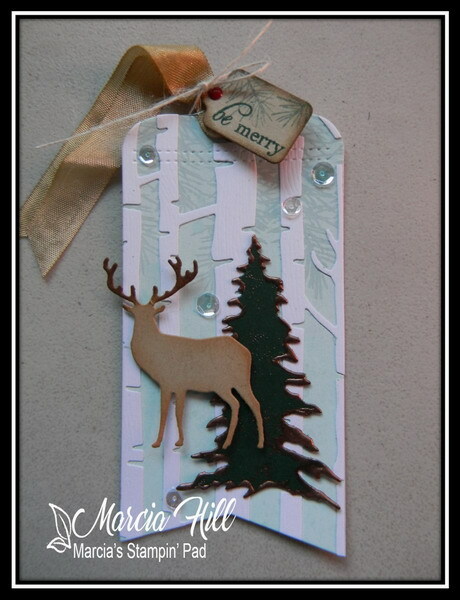 Love the tree colours and how the deer and ribbon match perfectly. Love the wee tag at the top. oops meant tag not card. The blue is so vibrant on your tag, Loll! I love it! Against the white it is so striking. Your friend's tag is just as beautiful in a soft and elegant way. Gorgeous dark blue color on your background tag Loll, it really makes the design pop. Loll ~ You are the 'Queen' of mixed media backgrounds...WOW! The deep, rich blue is so striking and I love how it contrasts with the white elements! Absolutely gorgeous tag!! !